Gladys Eberle, 92, of Spring Valley, MN passed away peacefully on Monday, February 4, 2019 at the Spring Valley Living Center. 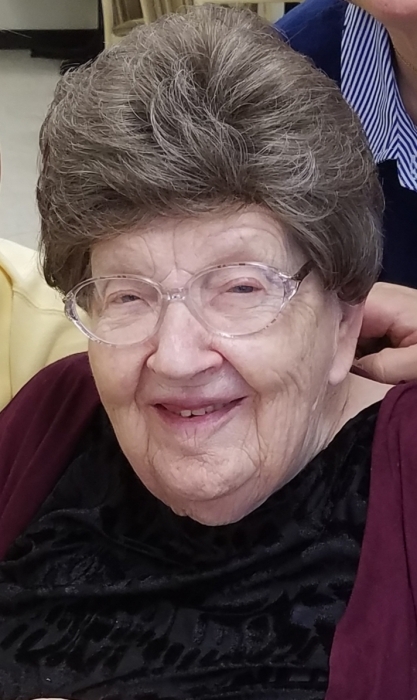 Funeral services for Gladys will be held at 1:00 p.m. on Saturday, February 9, 2019 at St. John’s Lutheran Church in Wykoff, MN. Visitation will be held from 4 to 6 p.m. on Friday, February 8 at Hindt Funeral Home in Spring Valley and will continue for one hour prior to the service at the church on Saturday. In lieu of flowers, memorials may be designated to the scholarship fund at St. John’s Lutheran School in Wykoff. Gladys Ruth Beulke was born in Carlos, MN on September 20, 1926 to Carl and Emma (Roth) Beulke. After graduating from high school, she attended two years of teaching school and began a career in education. Gladys was also the church organist at the Immanuel Lutheran Church in Carlos, MN and it was here that she met Rodel Eberle and they were married on April 9, 1950. They continued to live in Carlos until 1956 when they moved to Bloomington, MN where Rodel was the pastor at Mount Hope Lutheran Church. In 1963 Rodel was called to be the pastor at St. John’s Lutheran Church and the family moved toWykoff, MN. It was here that Gladys was able to use her teaching skills and she taught at St. John’s Lutheran School from 1968 until her retirement in 1988. Gladys and Rodel continued to live in Wykoff and she continued to volunteer her time to teach the art class at the school for a few years after her retirement. In 2015 Gladys and Rodel moved to the Spring Valley Assisted Living Center and later to the Spring Valley Senior Living Center. Gladys was very passionate about teaching and helping her students succeed. She was also a very talented and determined individual who loved playing the piano and singing in the St. John’s choir. Gladys was a strong believer in the power of prayer and she belonged to various prayer groups and teamed up with elementary students at the school to be their prayer partner. She loved all types of flowers and enjoyed gardening and her involvement with the local Garden and Quilting Clubs. She enjoyed serving others and was an active member of various church organizations such as the LWML, Ladies Aid, Lutherans for Life, and was an officer of the local AAL chapter for a period of time. Gladys also enjoyed helping with the local Fall Festival and eating at her favorite restaurant, The Branding Iron in Preston. Above all else, Gladys enjoyed time with her family and would host a weekly Sunday chicken dinner at her house for any of her family that could attend. Gladys is survived by her children Sue (Gary) Golish of St. Charles, MN, Ruth Ann Eberle of Spring Valley, Mark Eberle of Spring Valley, Nancy (Michael) McCarty of Belle Plaine, MN, Lori (Joe) Volkart of Spring Valley, Mary McGill of Spring Valley, Paul (Suz) Eberle, of Spring Valley, and Jon (Roxanne) Eberle, of Stewartville. She is also survived by 17 grandchildren and 14 great-grandchildren, and a brother Ralph Beulke of Miltona, MN. She was preceded in death by her parents, her husband Rodel, three sisters Ruth Beulke, Marie Brechbiel, and Elsie Jantzen, and two brothers Ed Beulke and Elroy Beulke.